Check out our YouTube Channel to see examples of TS Grading Stations in action. TS Manufacturing Grading Stations are available in single or multiple grader layouts, and can be retrofitted into existing installations. TS Multiple Grading Stations offer lug speeds up to 200 lugs/min. 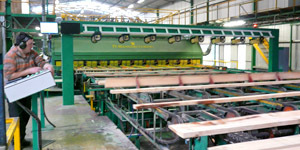 and can be fitted with TS Manufacturing Trimmers, Sorters, Stackers and other equipment, including grade mark readers. 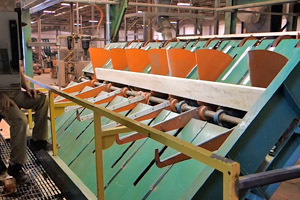 TS builds a variety of Grading Systems engineered to match your needs and requirements. With one of the widest array of center grading options, including sit down, walking on the chains, and stand-up / stool configurations, we can help you achieve the grade quality and production your system requires. Our Grading Stations are available with integrated Grade Scales, or a variety of scanning and measurement systems for accurate information presented to the grader. 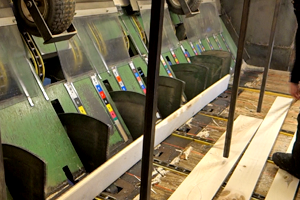 Center Grading Systems feature automated turning and singulation control, ensuring consistent board spacing, and allowing the grader to grade the boards at their own pace. This self-pacing has resulted in a 4%+ uplift in grade values at some installations. 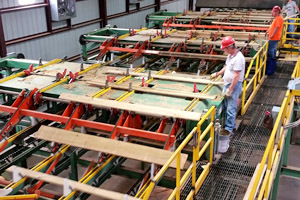 This system allows graders to continue to walk the chains with boards safely controlled by them, ensuring they don't become overwhelmed by the pace. These systems can also be installed with a cantilevered stool allowing the grader to operate from a seated position should they choose. This system is good for 17 to 20 boards per minute. 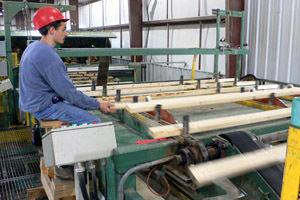 This system allows a reasonable surge of lumber to be provided to the grader. It also allows them to see both faces of the board from a seated position. 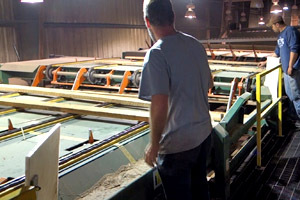 The system lowers a board onto a lugged transfer for grader operated trimming, or for simple grade mark printing and computer tallying to take place. The grader gets a good presentation and has the ability to manually re-turn the board. This system is capable of rates up to 22 boards per minute (though greater rates are possible if fed with multi-chains). We use our patented multi-chains to feed this grading station. This results in higher pieces per minute due to smoother control of the board as it transitions over the station. The board specifications are easily determined through the use of a measuring system in the lugs in front of the grader. 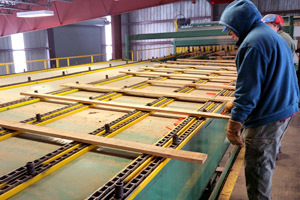 The grader is able to see both sides of the board and can manually re-turn it with the assistance of a grading stick. This system is capable 25+ boards per minute, and can be short coupled as shown, with a multi-chain take away. This allows higher rates of speed and center grading with a short footprint. When production demand increases, multiple graders are often required. 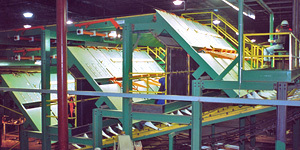 With stacked 'waterfall' style center grading systems, it is still possible to have multiple (up to 4) graders feed an Automatic Trimmer and Sorting System (bin or pull chain); all without losing the automation benefits of modern grading systems. These systems require only one person to feed the subsequent grading stations. The graders can be fed by unlugged backpressure and a dealing wheel (as shown), or with multi-chains and lugged feed for higher piece rates. All stations can handle a wide variety of boards, and are offered with either manual or automatic returning systems. Lugged feed systems can be integrated with overhead laser lights on a shifting frame, offering precision 'Maxi-Trim' solutions to the grader for greater recovery and flexibility. All stations can also be provided with a mobile grading seat, that allows the grader to precisely position themselves over the center of their boards. 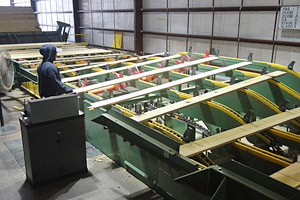 Sloped Chains with Speedup Chains - Simple End Grading for multiple graders that can move with the lumber, and use the speedup chains to assist in turning the boards. 'Shark Fin' Grading Stations - Available in sloped and unsloped chainways with single or multiple graders. 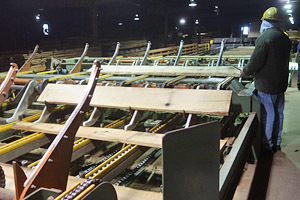 The boards are automatically turned for the grader. Lugged Grading with Servo Turner - This turning system can selectively turn pieces and doesn't require the proprietary lugs of the Shark Fin System. This results in transfer savings through the integration of even end rolls within the grading transfer. Unlugged Grading from the End - This allows multiple graders to grade boards that are not on lugs. 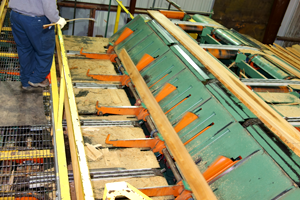 The result is slower transfer speeds that can be coupled with board spacing systems for ease of turning. These systems allow multiple graders to operate above the lug at a reduced lug speed for better high speed grading quality. Many stations are available with automatic turning. 'Shark Fin' Above Lug Stations - This allows piece rates of 25 bpm + per grader with multiple graders in sequence. Sloped Table with Surge Hooks - These stations allow for up to 22 bpm per grader and the grader can move with the more difficult boards. 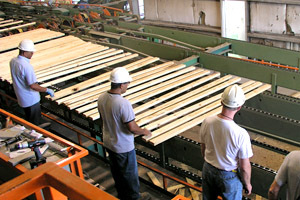 Each board 'stops' for a good inspection without motion at the hook stops. Table without Surge Hooks - These systems are capable of greater rates than the surge hooked stations and are able to fit more in a shorter footprint. Capable of 25+ bpm per grader. Lugged Table with Inertial Turning - Capable of 60+ bpm per station, with auto-turning. A good system for high speed dimensional grading. Lugged Table with Speedup Chains (not shown) - Capable of 25+ bpm per grader, they allow the flexibility to move with the board along the station, and assist turning along their full travel.